Mitochondria are known as the powerhouses of our cells because they generate energy to power them. But they also play a key role in the death of cells when they're damaged, infected, stressed, no longer needed, or at the end of their life. Some infections, like chlamydia, are able to trick cells into staying alive by tinkering with how these mitochondria work, just to make copies of itself. The Centers for Disease Control and Prevention estimate that 2.86 million chlamydia infections occur in the US each year. A new study not only describes the way chlamydia keeps cells alive until the organism is mature enough to infect other cells, it also reminds us of the vital role mitochondria play to fight pathogenic infections through programmed cell death that eliminates energy and other cellular processes bacteria needs to replicate and survive. Chlamydia, the most frequently reported bacterial STD in the US, must infect a live human cell to make copies of itself. The cell provides it with nutrients and a source of energy that chlamydia can't provide on its own. Having a pathogenic bacteria in our cells stresses them and kicks the mitochondria in those cells into action to initiate death of the cell and get rid of the invader in the process. Cell death would mean death to obligate pathogens like Chlamydia, too. But chlamydia-infected cells stay alive long enough for the organism to develop fully and create new infectious particles ready to infect other cells. The new research, led by microbiology professor Thomas Rudel at the University of Würzburg in Germany, demonstrated how chlamydia influences its survival by inhibiting normal cell death managed by mitochondria. The study was published in The Journal of Cell Biology. A chlamydia infection starts when the small, infectious particles called elementary bodies found in secretions — usually of the genital tract of an infected person — enters the cells of another person's genital tract. With a supply of nutrients and energy from the new cells, within eight hours, those tiny particles develop into reticulate bodies and begin to multiply. In the next 24 hours, some reticulate bodies revert to elementary bodies and burst out of the host cell, ready to infect nearby cells or another partner. And while all those processes are going on, chlamydia is interfering with the normal mitochondrial functions that would stop it. In response to infection, cell damage, stress, or aging, mitochondria release a protein that starts a cascade of enzymes — called caspases — which digest the cells' proteins. The enzymes break down the cellular components needed for survival and initiate production of other enzymes called DNAses, which destroy the DNA in the nucleus of the cell. In the process, mitochondria lose their integrity, fragment, and become dysfunctional, then the cell dies. 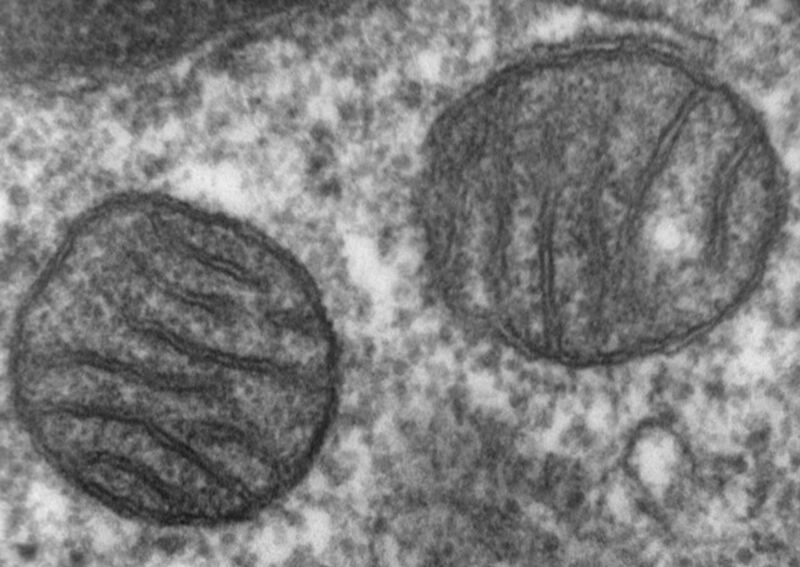 Fragmented mitochondria should inhibit chlamydial growth by decreasing the supply of energy to the cell and starving the bacteria, but this doesn't happen. The researchers found that Chlamydia bacteria increase production of a small piece of genetic material, called miR-30c, which turns off proteins that normally stop the cell from repairing the DNA damage triggered by the chlamydia infection. The new study showed that blocking this increase in miR-30c increases production of Drp1, a protein that breaks up the mitochondria when the cell is stressed. So when Chlamydia bacteria increased production of miR-30c, it prevented fragmentation of mitochondria and helped the cell repair broken DNA, ensuring the bacteria's survival. Knowing how the bacteria manipulates mitochondria to its own survival advantage may be knowledge we can use against chlamydia to beat it at its own game.